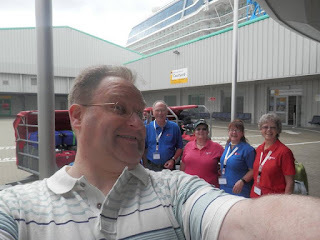 Last night I finally got back to Scotland after two extraordinary weeks away with Australian based Unlock the Past Cruises (www.unlockthepastcruises.com), for whom I worked as a speaker on a Baltic Sea bound genealogy cruise. It was an amazing fortnight, and one from which I am absolutely exhausted! 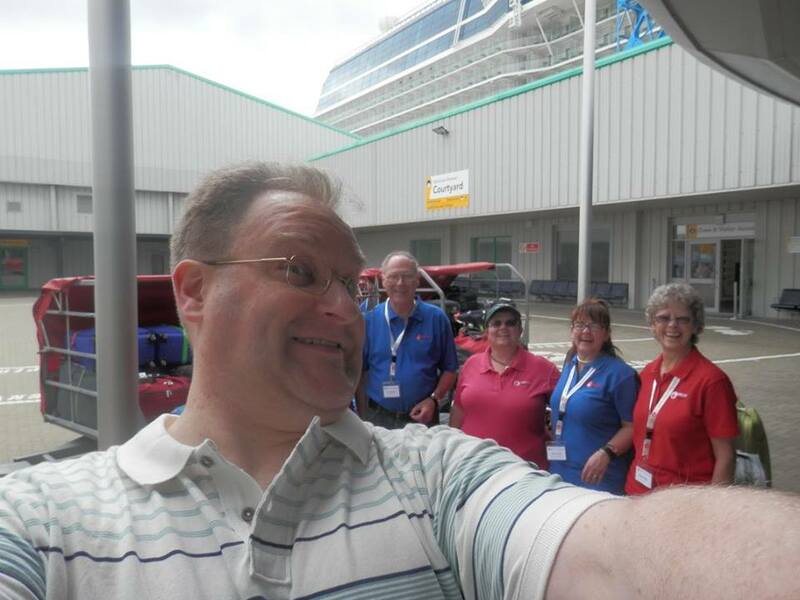 This was my third cruise with the firm, but in the past the set up in the Australian and New Zealand based cruises has been that I would give a series of talks on board the boat, and then at port stops give additional talks to locally based family history societies. On this occasion I was only required to speak on board, meaning that for the first time I was able to enjoy all the port stops as a tourist - and what a programme! Starting and ending at Southampton, we also visited Zeebrugge, Blankenberge and Bruges (Belgium), Warnemunde and Berlin (Germany), Tallinn (Estonia), St Petersburg (Russia), Helsinki (Finland), Stockholm (Sweden) and Copenhagen (Denmark). As a passionate European, I have now managed to visit many more countries on our continent for the first time and learned so much more about its wonderful diversity. On the genealogy side of things, I also managed to pick up some great tips and information from other speakers, including Janet Few, Christopher Braund, Shauna Hicks, Jane Taubman, Caroline Gurney, Helen Smith, Rosemary Kopittke, Eric Kopittke, Carole Baxter, and all the way from the USA, Cyndi Ingle and Paul Milner. A great line up, a great programme, and a great two weeks on the weather front. We kicked off from Southampton on Saturday July 11th and set sail for Belgium, with Paul Milner giving the first entertaining talk in the evening on what our ancestors were really like. On this trip I shared a cabin with Tony Beardshaw from Yorkshire based My History (www.my-history.co.uk), who was on board to run the book shop for the conference, and after arriving on the Celebrity Eclipse at Zeebrugge early on the Sunday morning, Day 2 started with the two of us setting off for Blankenberge, a beautiful seaside town from which we could then get a train into Bruges. We managed to take a quick half hour look around Blankenberge, finding an interesting war memorial on the beach, before hopping on to a double decker train into Bruges - though not before being removed by the conductor, along with half of the Eclipse's passengers, from the first coach that we all settled in, which soon turned out to be for first class passengers only! Once in Bruges we spent a few hours taking in the sites 'on a dander' (an Ulster saying meaning with no fixed agenda!) before returning for the all important 'all aboard time'. This is only the third time I have been to Belgium, my last visit there having been about ten years ago to try to trace information on my great grandfather, who ran two shops in Brussels from the late 19th century until he died there as a civilian in hiding during the German occupation in 1916. The centre of Bruges felt similar to the old part of Brussels city centre, though the whole town was one with a lot more historic preservation than the Belgian capital. We returned to the ship for 3pm, and by 3.30pm I was giving my first talk on Genealogy Without Borders, examining personal identity and the need to explore the diaspora for the complete family story - and coincidentally featuring a good ten minutes on my family's Belgian based civilian story from the First Word War. Day 3 was our first full conference day at sea, and as such I attended many talks. The first was a useful session on merchant seamen's records by Caroline Gurney, which really helped to flesh out my somewhat limited knowledge on the subject, and then it was straight into a session on writing by Oz based author and genie Carol Baxter. I found Carol's sessions extremely useful, in that although I write a lot myself, I came into it from a different background (I previously worked in television), and as such, it was refreshing and informative to listen to her approach on the subject. The next talk I attended was Eric Kopittke's absolutely superb session on research in German civil and parish records. I know very little about German genealogy, and what little I thought I knew soon turned out to be stuff I didn't know at all! 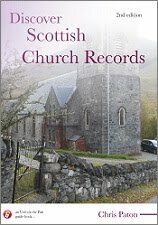 Soon I was learning about the country's various standesamter, details in the civil records (very similar to those found in Scottish records), the locations of church records and more. I bought Eric's book on the subject as a result, which I will review in due course. After lunch I listened to Janet Few's useful talk on some less well known UK sources. Although predominantly focussed on English based resources, there were some interesting sites I had not heard of before discussed, including the History of Advertising Trust site at www.hatads.org.uk and the HistoryGeo site at www.historygeo.com, detailing landowner maps in the US. At this point I was due to give a talk on Scottish Land Records, but although I got started, we unfortunately had to abandon it after five minutes due to a double booking error of the venue - the ship's bingo ended up winning, and so my talk had to be rescheduled for later in the cruise. After a quick coffee, I attended Carol Baxter's session on Gripping Writing, after which we then broke for dinner. The final session of the day was a real treat - Cyndi Ingle doing a talk about her major online resource Cyndi's List (www.cyndislist.com), the world's best known online genealogy directory. Cyndi has put her heart, soul, money, time, and a significant chunk of her life, into maintaining this site, and it was a real honour to have her guide us through it. The site recently underwent a major upgrade in 2011 - we're now on Cyndi's List 2.0 - to allow it to be future proofed for the next few years. To offset the costs, there is a donation button now on the site to allow for voluntary contributions from users to help, with some 81% of the costs already cleared. Meeting Cyndi, her mum and her son Evan was one of many highlights on the trip, but three days in we still had plenty more gems ahead of us...! 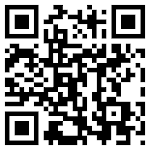 If you use the Cyndi's List site, please do consider making a donation - and for the reasons why, you can do no better than to read Judy Russell's excellent piece about Cyndi's contribution to genealogy at www.legalgenealogist.com/blog/2015/06/23/supporting-cyndis-list/. Coming next - the Berlin Wall, missing a train back to the boat from Berlin, Discovering English parish registers, the magnificence of Tallinn - and 17th century surgery at the hands of Master Christopher and Mistress Agnes...!